Are you someone who wants to exchange your mobile phone online to buy a new mobile phone for you? If yes, you are in the right place. You can find out the best mobile exchange offers updated here. Plus Extra ₹3,000 off is included in the exchange value when you purchase Lenovo Z2 Plus under the exchange program. Offer valid only on (Black, 64 GB), (Black, 32 GB) and (White, 64 GB) variants. Get cashback worth ₹2,000 as Amazon.in Gift Card on purchase of this product through pre-paid payment transaction*. Check whether your pin code is available for exchange offer by checking in the right side of the product page. >>>>>Go and Grab it now by clicking on the 'Shop Now' button below. Click on the above banner to buy in the deal price of Rs.33,990. Get additional exchange offer too. Follow the below steps to find the mobile exchange offers in Flipkart. 1. 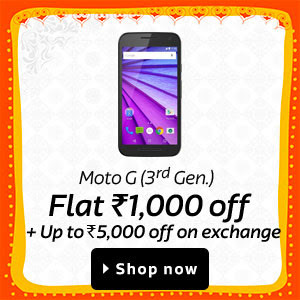 Visit the Flipkart mobile exchange offer page link here. 2. You will find all the mobiles in exchange offers. 3. Buy your desired mobile. Exchange discount upto Rs.20,300 for 32 GB. Exchange discount upto Rs.25,500 for 64 GB. Available in No Cost EMI. Click on Buy from Flipkart button below. You will be redirected to the product page where you will find a link called 'Buy with exchange'. Click on that and check the exchange value of your old mobile. Offer is available only in Flipkart App. Now get flat Rs.1,000 Off on Moto G (3rd Gen) on all variants in Flipkart. Exchange Offer is available Up To Rs.5000. Mobile Phone Exchange offer is valid only for functional and Display-Intact Devices. IMEI No. will be verified on collection. 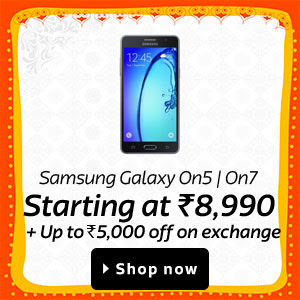 Samsung Galaxy On5 and Samsung Glaxy On7 starting at Rs.8,990. Extra 10% Off On SBI Debit And Credit Cards on The Flipkart App. 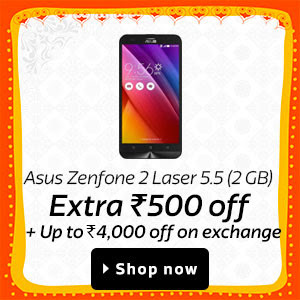 Asus Zenfone 2 Laser Extra Rs.500 Off + Up to Rs.4000 discount on exchange. Exchange Offer is available Up To Rs.4000. Mobile Phone Exchange offer is valid only for functional and Display-Intact Devices. IMEI No. will be verified on collection. 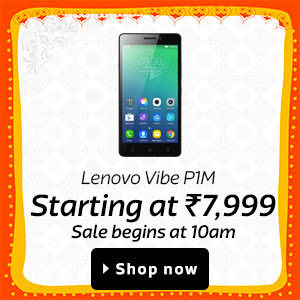 Lenovo Vibe P1 at just Rs.15,999 + Up to Rs.8000 discount on exchange. Exchange Offer is available Up To Rs.8000. Mobile Phone Exchange offer is valid only for functional and Display-Intact Devices. IMEI No. will be verified on collection. 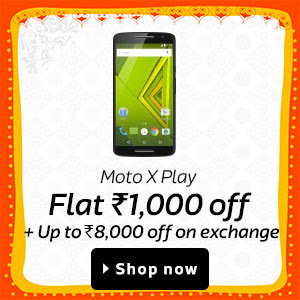 Moto X Play at flat Rs.1000 off + Up to Rs.8000 discount on exchange. Flat Rs.1000 off on Moto X Play in Flipkart App. 1. Flipkart Mobile Phone exchange offer is available only on Flipkart App most of the time. 2. Do not forget to check if any extra discount available at the time of buying. Currently there is extra 10% Off On SBI Debit And Credit Cards on The Flipkart App. 1. Always read the website's terms and conditions before going for the exchange offer. 2. Most of the online websites like Flipkart are offering exciting mobile exchange offer deals only in their Apps. So, download app and check for best mobile exchange offers online.